Andromium launched this ambitious product on Kickstarter – a website “designed to bring creative projects to life” – and is available at . A US-based startup has launched a smart laptop shell that turns your Android smartphone into a complete laptop – making it more convenient and affordable for people in developing countries like India and South Africa to carry their office in their pocket, literally. The shell, called Superbook by Andromium Inc., makes an Android smartphone output look very much like a desktop environment. It is essentially a “dumb terminal”– a notebook without a processor but with a keyboard, battery, trackpad and display, TreeHugger reported on Saturday. Andromium launched this ambitious product on Kickstarter – a website “designed to bring creative projects to life” – and is available at $99. 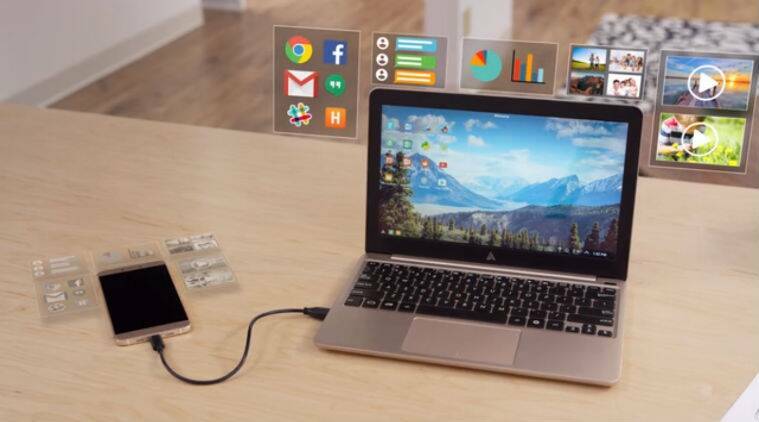 Developed by Andrew Jiang and his team at Andromium, the Superbook provides a large screen, keyboard and multi-touch trackpad, more than eight hours of battery and phone-charging capabilities. When plugged into Android smartphone, it launches an app to deliver the full laptop experience. According to Andrew, the app is essentially Android Continuum that lets you work seamlessly – going from phone to notebook. “With the Superbook, you can do everything you can do on a laptop – and more. With desktop-class browsing, access to office applications, games, and even programming, the opportunities are limitless,” Andromium said in its project description on Kickstarter. MESUIT is another such case, but serves a different purpose. Haimawan, a Chinese mobile OS virtualisation company has created MESUIT case that lets users run Android on an iPhone. The case can be used to run a proprietary Android-based OS, called Mesuit OS 1.0, on iPhone 6/6S and iPhone 6Plus/6S Plus devices. The device also works as an external battery pack and a storage device (32GB, 64GB and 128GB). The case also has its own SIM slot.